Have the best time when you attend the Conley Invitational in Palmetto, Florida, by purchasing one of our sponsor packages. Our most popular package is the Conley-Arctic Air VIP Experience. The VIP Experience provides you with many exclusive perks that you'll love. Not only will you be provided with VIP parking privileges, but also access to the VIP Tent area. This area serves food, beer, and water before, during and after the rodeo competition. Additionally, you'll receive a behind-the-scenes, escorted tour of the bull riding area. 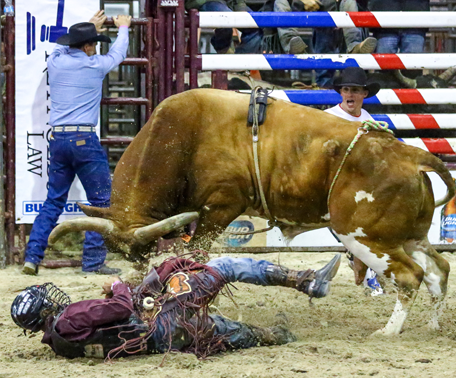 If you want to get up close and personal with the cowboys and the big bulls, you're in luck. The Conley-Arctic Air VIP Experience affords you that and more. You'll receive tickets to attend the awards banquet that will be held that Thursday evening as well. At the banquet, you'll be able to meet the bull riders and get to watch them receive their awards for their accomplishments during the season, leading up to this big final event. Moreover, you'll have special seating with the best views of the entire event. This package will give you, your employees, family, business associates, or whomever you decide to invite an unforgettable experience. Don't miss out. Sign up for a sponsor package today! For those purchasing sponsorship levels that contain VIP Experience Passes, you may purchase an additional package for $125 per night. This package will be good for both nights.